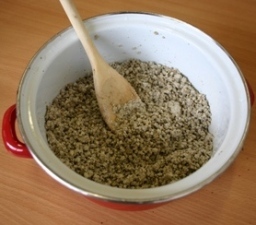 Mix the dry components vermiculite and the brown rice flour very well. Add the water to it and mix it again. 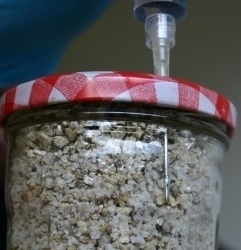 Fill the jars one by one with the substrate. Do this very loose; the mycelium needs space to develop itself. Make sure there is still 1 cm. remaining to the brim. 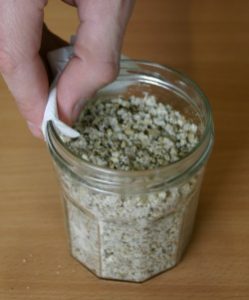 Wipe the top clean with a tissue and fill the last centimeter with only vermiculite. This reduces the chance of contamination. 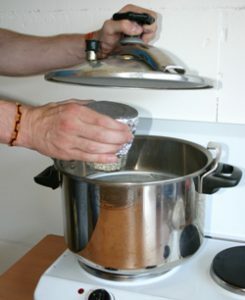 Close the jars with the lids and cover them with a large double layer of tin foil. Now it is time to sterilize the substrate. Sterilize the jars at 15 psi for 30 minutes. Take the jars out of the pan after they have completely cooled down. Cooling the sterilized jars takes at least a couple of hours. Don’t be too impatient. A substrate that is too warm can kill the mushroom spores and all preparations will be for nothing. Before you inoculate your rice-flour cakes, you have to sterilize the needle of your syringe first. Sterilize it by heating it with a gas burner until it starts to glow red. Let the needle completely cool down during 20-30 seconds. After cooling down shake the syringe very well, so the spores will get divided in the syringe again. 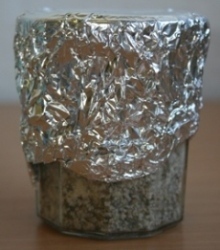 Remove the tinfoil and inoculate the culture medium with the spore syringe through the 4 holes in the lid against the glass of the jar. You should see the spore water running down. 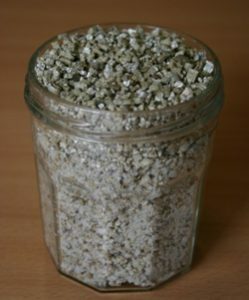 A total of 1-2 ml of spore water for every jar should be more than enough. 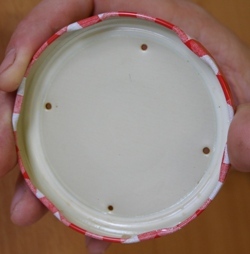 After inoculation close the 4 holes again with some tape. 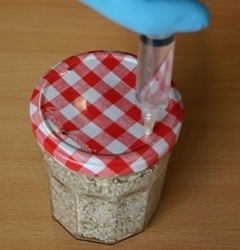 Place the inoculated jars in a warm and dark place. The ideal temperature is 28-30°C. A cupboard above the fridge, for example, is a nice place. The fridge creates warmth at the back and heat always goes up. You can also use some heat elements. Now the work is done for a while, as the spores need time to germinate and develop themselves. 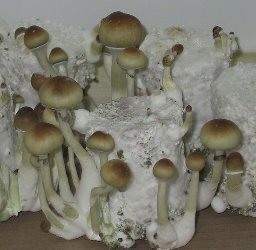 About 3 to 5 days after inoculating the jars, small white dots will appear. These are the mushroom spores that have germinated and grown into mycelium. After 2 to 4 weeks the rice-flour cake will be totally white. The next important action can begin. 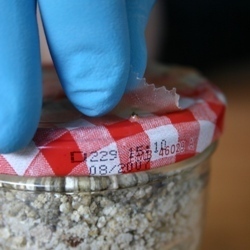 It’s time to remove the substrate from the jar and place it into the fruiting conditions. 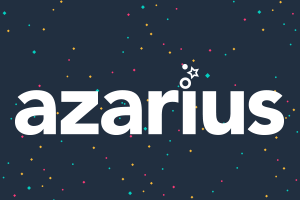 The fruiting conditions mean that you expose the mycelium to fresh air, light and a lower temperature. 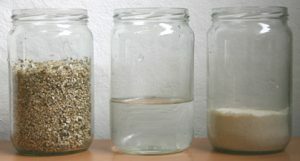 The changing of these three elements will trigger the mycelium to form mushrooms. 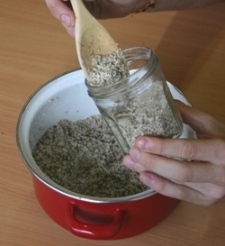 Place the rice-flour cake upside down in your grow room and remove the jar. This can be done by (gently) tapping on the bottom. Finally, place the box in a sunlit room. Make sure they are not in direct sunlight. After 1 to 2 weeks the first pinheads will emerge. From this moment on growth can be very rapid. Within a few days, the first mushrooms may already have reached their mature hood.